Reporters assumed the statement would be about Obama’s birthplace, and, sensing an opportunity to halt Hilary’s decline in the polls, hurried to the Trump International en masse, with camera crews in tow. The cable news networks cleared time to broadcast the anticipated Trump humiliation live. Networks going to stick with Trump as he tries to cloak his racist birtherism in the herosim and service of these vets? Once again, the American news media gets totally played by Trump. Wall-to-wall coverage. We’re all guilty. 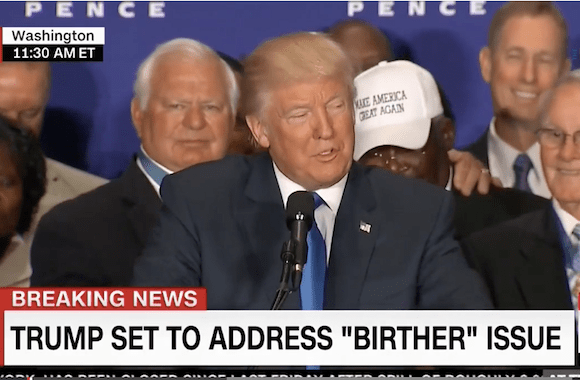 What’s funny about this is that reporters were done in by their own partisan obsession with “birtherism,” the now-discredited suspicion that Obama was telling the truth when he claimed for many years to have been born in Kenya. Trump’s tweet said not a word about it, but reporters let wishful thinking get the better of them. To be fair, it isn’t difficult to outsmart most reporters. But it is still fun to see it done in such epic fashion. Via Drudge, who is riding high these days.